Providing the couple with their Couple's Workbook. Providing the couple's parish with a copy of the Pre-marital Inventory Report. Note: Only one needed per couple. FULLY ENGAGED is a Catholic, catechetical, premarital inventory and marriage formation program. Fully Engaged is a Catholic premarital inventory designed to help engaged couples build a foundation for the Sacrament of Marriage. Grounded in Church teaching, this dynamic premarital inventory is a trustworthy guide that meets the real challenges today’s couples face. Fully Engaged helps couples to grow in their Catholic identity by integrating Church teaching into its materials. With the Couple’s Workbook and monthly follow up emails, Fully Engaged seeks to ensure that the couple continues to grow in their Sacrament throughout this time of preparation and beyond. Fully Engaged will strengthen and help you grow in 16 areas of your marriage. Register on this website's shopping cart. Begin your purchase by filling out the required personal information. – Add to cart. Complete your Checkout on the Cart. Within 24 hours (weekends excepted), you will be emailed an 8-digit Couple ID Login Code from Fully Engaged's website, www.getfullyengaged.com. This 8-digit login code is separate from your registration login for this website. Make sure to check your spam/junk folder for this email as some email providers will direct it to one of these folders. Once you receive your code, log into the Fully Engaged website, www.getfullyengaged.com, with your 8-digit Couple ID. State if you are the bride or groom. The couple completes the pre-marital inventory online. 1. 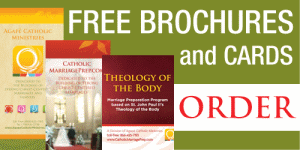 Your results will be sent to Catholic Marriage Prep for disbursement to your Parish/Priest. 2. Fully Engaged will receive your Couple Workbook order which will be mailed to you.